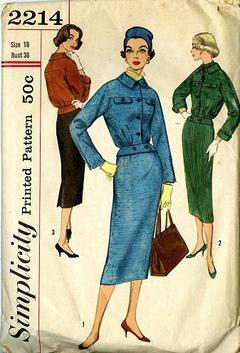 1957 Simplicity #2214 vintage sewing pattern, misses' tailored, fitted two-piece suit, plus size 16. All views feature jacket gathered to shaped band at lower edge giving a blouson effect. Jacket buttons in front, has pointed collar, long kimono sleeves with openings at lower edges of seams. Sleeves may turn back to form cuffs. Slim skirt has back kick-pleat.